Although a new nation, Romania has an ancient history. During the Roman Empire, Romania was the province of Dacia. For centuries, Romania was a battleground between opposing forces, Romans versus Germanic invaders, Christianity against pagan faiths, Magyars battling Teutonic knights, and Mongols fighting native Romanians for the control of the principalities of Walachia, Moldavia and Transylvania. These same principalities were short-lived nation states united briefly during the reign of Michael the Brave (1593-1601). The more powerful empires of the Ottomans and Habsburgs divided the region with Walachia and Moldavia coming under the control of Constantinople, and Transylvania under Habsburg rule from Vienna. Besides Michael the Brave, only Vlad Tepes, prince of Transylvania and later Walachia, gained international renown as nineteenth-century British author Brom Stoker's model for the fictional Dracula. During the next 250 years, the region that would become Romania remained divided by its Muslim Ottoman and Roman Catholic German overlords. In the eighteenth century, Ottoman influence was gradually replaced with Russian involvement in Romania politics. With support from Great Britain and France, a united Romania was born in 1861 under the leadership of Alex-andru Cuza. Cuza's reforms quickly lost support among Romania's nobles, politicians, and clergy. A military coup in 1866 ended Cuza's reign. The great powers intervened and selected a German prince from the Roman Catholic House of Hohenzollern-Sigmaringen to govern Romania. King Carol (Charles) I governed Romania from 1866 until his death in 1914. A constitutional government was established, the Romanian Orthodox Church declared the official state religion, and a reformed legal system adopted. Romania's 1866 Constitution guaranteed freedom of the press and an end to censorship. King Carol navigated Romania's conflicting internal demands for land reform, and anti-Semitism and nationalistic desires, to expand Romania at the expense of the Ottoman and Habsburg empires. Successful participation in the Second Balkan War of 1913 added the Black Sea coastal region of Dobruja, captured from Bulgaria, to a Greater Romania. King Carol, a German and a distant cousin of the German Kaiser Wilhelm II, signed a secret alliance with the Central Powers. Declining health found Carol unable to force Romania to join Germany and neighboring Austria-Hungary in World War I. Carol died in 1914 and while Romania suffered four years of invasion and desolation at the hands of Germans, Hungarians and Bulgarians, the defeat of the Central Powers ultimately added to the Romanian kingdom the districts of Bessarabia and Bukovina from the Soviet Union and Transylvania from Hungary. A revised constitution was enacted in 1923 with Articles 5, 25, and 26 devoted to freedom of the press. Censorship and press restrictions were not countenanced and all citizens regardless of rank or status guaranteed the same press and speech freedoms. During the reigns of Ferdinand I (1914-1927) and his successor, grandson, Mihai I (1927-30), the Romanian press flourished and rivaled in number and professionalism those of Western Europe. Romania's print media numbered more than 1,300 newspapers before 1938 with 140 being daily newspapers. There were more than 2,250 magazines and other specialty publications printed in Romania. The freedom the press enjoyed changed when the young King Mihai was deposed. King Carol II, who ruled from 1930-1940, gradually reduced the freedoms Romanians enjoyed under the 1923 Constitution. In 1938 a royal dictatorship was established in collaboration with Romania's Fascist Iron Guards that sent the democratic forces into exile or hiding. The brutal destruction of Poland by Hitler, the collapse of France and the menacing troop movements along Romania's border with the Soviet Union forced King Carol to bring Romania into the Axis Alliance—but at his country's expense. Large sections of Romania were surrendered to Hungary and Bulgaria. The Soviet Union demanded and got Bessarabia and Bukovnia, in exchange for not invading. Carol II was unable to politically survive these territorial concessions. Iron Guard General Ion Antonescu deposed Carol in 1940 and restored King Mihai to the throne. From 1940 until Antonescu's overthrow in 1943, Romanians suffered at the hands of a brutal regime. The Antonescu regime suppressed all opposition. The retreat of German forces in 1943 brought Romania's democratic parties and politicians back into the public arena. They formed an alliance with King Mihai, who fired Prime Minister General Antonescu and restored the 1923 Constitution. Remarkably the overthrow of Antonescu led to a brilliant, though brief, flowering of the Romanian press. New democratic dailies Democratul, Curierul, and Jurnalul de Dimineata each quickly reached circulations of more than 100,000. The newly emerged democratic parties printed their own publications, Dreptatea, Liberalul, and Libertatea. By September 1944, Curierul's circulation numbered around 350,000. King Mihai's new government abolished the Iron Guard's Propaganda Ministry. The Ministry of Foreign Affairs was given responsibility for the news media in order to protect and reassure foreign journalists in Romania. Law No. 462, published in the Official Bulletin ( Monitorul Oficial ) No. 218/1944, stated that there would be no administrative censorship whatsoever except for the customary war censorship exercised by military personnel. The Allied (Soviet) Control Commission established in Bucharest in 1944 changed everything. Soviet and Romanian Communist authorities began to restrict press freedoms. Article 16 of the Armistice allowed the authorities to regulate the printing, importation, and distribution in Romania of periodicals and other publications as well as radio broadcasts, the postal, telegraph, and telephone communications networks. Annex F of the agreement allowed the Romanian government and its organs to act in accordance with the instructions of the (Soviet dominated) Allied Control Commission. The Control Commission imposed strict censorship on all forms of communication, particularly the press. Soviet occupation forces published their own Romanian language newspaper, Graiul Nou. Romania's official news agency Rador was increasingly overruled and ignored by directives issued by Graiul Nou. Democratul was suppressed for offending the Soviet Army and its editor jailed. Curierul had part of its operation taken over by the Red Army and Communist Party newspapers. Viitorul was suppressed at the insistence of the Soviet legation in Bucharest. Universul was suspended from publication and purchased by a communist organization. In the provinces, the oldest Romanian language newspaper, Gazeta Tansilvaniei, published in Brashov, was suspended from publication. Only Communist Party media were free to publish. Dispatches from foreign non-communist correspondents had to clear Soviet censors. The publications of Romania's political parties were shortened in length and frequently found their text substituted with communist writings. A useful tool of the communists was to gain control over the typesetter's unions, which refused to print articles or news that was critical of the Soviets. Soviet influence extended to the sale and distribution of newsprint, which was distributed to only Communist propaganda organs. Administrative Order No. 3395, published March 22, 1945, decreed the need to preserve the secrecy of military operations, domestic order, and state security. Supervision of all Romanian and foreign publications distributed and published in Romania were regulated by the Allied Control Commission. Law No. 102 and Order No. 3595, published in the Official Gazette February 12, 1945, emphasized that the Romanian press would be purged of all fascist elements. A purge commission was quickly established. Many journalists were arrested and disappeared. Freedom of association ended in Romania. Only communist journalists were published. The Communist government on January 8, 1946, gave assurances that Romania respected freedom of the press. A few political parties continued to publish, primarily the National Peasant Party's Dreptatea and Patria and the Liberals' Liberalul and Natiunea Romana. The Social Democrats were denied publication rights. In 1946 just 26 newspapers continued to publish. Only six could be described as independent publications. Both censorship and the high cost of newsprint destroyed the remaining privately owned publications. After the Paris peace treaties were signed in February 1947, Romania's last two political opposition newspapers, Dreptatea and Liberalul, ceased publication. The independents, Jurnalul de Dimineata, Monentul, Fapta, Finante si Industrie, and Bursa were suppressed and ended publication in January 1948. The combined circulation of all five newspapers had barely numbered 120,000. The death of freedom of the press in Romania corresponded with the forced abdication at gunpoint of King Mihai on December 30, 1947. The king was sent into exile. With the non-communist press all but destroyed, communist publications began to proliferate. The major communist newspapers were Scanateia, Romania Libera, and Viata Sindicala. After the proclamation of the Peoples Republic of Romania in 1948, additional newspapers were added: Glasul Armatei, Contemproanul, Romaniai Magyar Szo, Scanteia Tineretului, Libertatea, Scanteia Pionierului, Neuer Weg, Gazeta Invatamantului, Urzica, Scanteia, and Satelor. Combined circulations numbered more than 2.7 million readers. Romania's new constitution guaranteed rights, liberties, and full access to the press. Under Romania's Communist regime, the press was subservient to the Communist Party. The Central Committee and the Political Bureau of the party controlled the media through their propaganda sections. Regional and local presses were given their instructions by local Communist authorities. The Central Committee of the Romanian Workers' Party proclaimed in March 1951 that all printed materials must conform to the high principals and spirit of the party. Decrees No. 62 and 64 created the Ministry of Arts and Information, which was assigned the responsibility to monitor the Directorate of Press and Printing, state news agencies and the media. During the 1950s and 1960s while under a succession of Romanian Communist leaders, the media served as a propaganda tool for indoctrination and disinformation. The media was controlled by an interlocking group of party and state organizations, supervising bodies, and operating agencies that controlled both print and broadcast media. Romania's newly revised constitution in 1965 promised freedom for the media, but the media was not permitted to print or broadcast information deemed hostile to the socialist system or the interests of the working people. Romania's 1965 adoption of a new constitution coincided with the selection of Nicolae Ceausescu as president. Ceausescu found favor with the West for his independent form of nationalistic communism. The Romanian Communist Party had full control over all information agencies including the Council for Socialist Culture and Education, and the Council of Romanian Radio and Television. In 1985, Elena Ceausescu, Nicolae Ceausescu's wife, chaired the National Council for Science and Education created to establish uniform policies in science, technology, and education. The propaganda and media section of the Central Committee supervised all publications. The Romanian Press Agency, individual publishing houses, printing establishments, book distribution centers, motion picture studios, and radio and television stations were all regulated by the Central Committee's initiatives. The number of print media publications in Romania dropped under Ceausescu from 51 dailies, 23 weeklies, and two semi-weeklies in 1969, to 36 dailies and 24 weeklies in 1985. The daily with the largest circulation was Scinteia, founded in 1931 as the mouthpiece of the Central Committee of the Communist Party. Originally an eight-page daily, it was condensed during the Ceausescu years to a four-page daily and one six-page publication per week. This newspaper's articles were reprinted in provincial newspapers, shop bulletins, and enterprise newsletters. Romania Libera, founded in 1942 by the Socialist Unity Front, concentrated on local issues although some news stories were about international events. This newspaper was the only one allowed to have advertisements—but just one page. Other major communist newspapers included the weekly Munca, the youth oriented Scinteia Timeretului, the Hungarian daily Elore, and the German daily Neuer Weg. All published official government positions. The number of periodicals also decreased during the Ceausescu period. 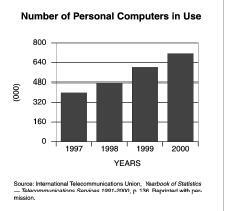 In 1969, 581 periodicals were printed as compared to 422 in 1985. Periodicals were subjected to the same government control, licensing, and supervision, as were newspapers. Most magazines and journals were party or government entities. Agentia Romana de Presa ( Agerpres ), created in 1949 as the Romanian Press Agency, was under the control of the Romanian Communist Party. Agerpres collected and distributed all news, pictures, and press items to domestic and foreign media. After 1960, the Communist regime used radio to disseminate propaganda. More broadcast facilities were constructed. Three medium-wave and one FM station broadcast news. An estimated 200 hours of broadcasting was done in 13 languages domestically and to foreign countries by Radio Bucharest. Television came under more scrutiny than did radio broadcasting. In 1984 Ceausescu denounced television as corrupted by Western influences. In 1989 the two national television stations were merged into one with only 22 hours of broadcast time. The Council for Socialist Culture and Education controlled all book publishing. The number of titles published steadily rose from 1955 to 1996 to 9,000 titles, but during the 1980s severe regulations imposed by the Ceausescu regime actually reduced the number of published books to 3,063 titles, with the majority published and written by Ceausescu himself. The Council for Socialist Culture and Education during the Ceausescu era determined publishing guidelines, the number of book distribution centers, the number of books printed, and the prices of books for sale. The number of publishing houses decreased from 25 around 1970 to 18 at the end of the Ceausescu era. As communism collapsed in Eastern Europe and the Soviet Union, it appeared that Romania's communist regime would survive. To the surprise of many in the West, a rebellion was started in Timisoara by Hungarian pastor Laszlo Tokes. Tokes was persecuted by the secret police because his sermons attacked Romania's lack of freedom. Attempts by the Romanian government to evict Tokes from his church were met with resistance. News of the Timisoara rebellion spread rapidly throughout Romania despite of a government-controlled media. Foreign news broadcasts received in Romania kept the flames of rebellion alive. The rebellion spread to Bucharest. Recognizing that the army was deserting him, Ceausescu fled Bucharest only to be captured and executed along with his wife. Although a newly empowered media claimed 70,000 died in the rebellion, the actual total was around 1,000. The deaths of the Ceausescus left a power vacuum quickly filled by former Central Committee member Ion Iliescu. Romania replaced its communist-era constitution with a new one on December 8, 1991. Romania is a parliamentary republic with a president elected by popular vote every four years. A presidential run-off election is held two weeks after the first race if no candidate wins a majority of the vote. The nation's prime minister is appointed by the president and is advised by a Council of Ministers. Romania's parliament ( Parlamen t) is a bicameral legislature consisting of a Senate ( Senat ) with 140 members and a Chamber of Deputies ( Adunarea Deputatilo r) with 345 members. The membership of both chambers is elected by popular vote on a proportional basis for four-year terms. The Supreme Court of Justice is Romania's highest judicial court. The president, on the recommendation of the Superior Council of Magistrates, appoints judges. The nation's legal system is a mixture of the civil law system and communist legal theory. Legal revisions are molded on France's constitution for the Fifth Republic. Late Twentieth Century Media Figures After the revolution of 1989, the Romanian people indicated their need for information by their increased purchasing of daily newspapers. The daily newspapers Adevarul and Romania Libera each increased circulation to about 1.5 million readers within a year. A number of other Bucharest dailies saw readership soar to around 700,000. Since 1990 circulations have declined because of higher printing costs, a decline in government subsidies, lack of advertising revenue, and the increased cost of the newspapers. A report by the European Journalism Center noted that it is difficult to distinguish between Romanian newspapers printing tabloid stories for newspapers and newspapers, which cover more legitimate stories. The European Institute for the Media reported that Romanian newspapers offered superficial coverage of important political events and seldom probed the activities of government officials. In 2001, there were 15 privately owned national newspapers, including: Evenimentul Zilei, Romana Libera, Ziua, Adevarul, Libertatea, and Sotidianul. Both Vocea Romaniei and Dimineata receive government subsidies. Major minority newspapers are the Hungarian language daily Romaniay Magyar Szo and the German language daily Deutsche Algemeine Zeitung. Romania had an estimated 100 daily newspapers in 1999 and more than 2,200 periodicals, including 200 periodicals published in minority languages. In 1999 Romanian publishing houses printed 8,000 titles. Romania's major morning dailies, all published in the capital, Bucharest (with 1995 circulations in parentheses) included: Adevarul (150,000), Azi (20,000), Cotidianul (26,000), Cronica Romana (100,000), Curierul National (40,000), Dimineata (40,000), Economistul (35,000), Evenimentul Zilel (350,000), Nine O'Clock (30,000), Romanian Libera (175,000), Tineretul Liber (60,000), Vocea Romaniel (50,000), and Vremea (15,000). The sole major evening newspaper was Libertatea (60,000). Major general interest periodicals are the following weeklies: Cuvintul (1995 circlation of 100,000), Express, (170,000), Flacara, (12,000), and Lumea Magazin (60,000). Special-interest publications include the weekly periodicals Dreptatea (6,700), Tribuna Economica (40,000), and Via Medicala, a health publication (35,000). Monthly periodicals include the women's magazine Femeia (70,000), Magazine Istoric (110,000), and the Jurists Union publication Palatul de Justitie (75,000). The population of Romania is overwhelmingly Romanian (90 percent). The nation's remaining population is distributed among ethnic Hungarians (7 percent), Germans (0.5 percent), and Ukrainians (0.3 percent). More than 70 percent of the population belongs to the Romanian Orthodox Church. Other practicing religions in Romania include: Roman Catholic (3 percent), Uniate Catholic (3 percent), and Protestant (6 percent). An estimated 18 percent of Romanians are not affiliated with any religion. Romanian, Hungarian, and German are the nation's major spoken languages. Although Romania is one of Europe's poorest nations, the country is rich in natural resources and economic potential. The nation is burdened with an antiquated industrial base from decades of communist mismanagement. Romania's transition to democracy found Romanians holding the government responsible for questionable business practices, charges of corruption, and the failure to rapidly privatize state-owned industry. During the 1990s, Romanians witnessed a rapid decline in real wages and living standards. Romania's labor force is distributed between agriculture (40 percent), industry (25 percent), and services (35 percent). The nation's major industries produce textiles and footwear, light machinery and auto assembly, mining, timber, construction materials, metallurgy, chemicals, food processing, and petroleum refining. The agricultural sector produces for export wheat, corn, sugar beets, sunflower seeds, potatoes, grapes and sheep. The overthrow of the Ceausescus ended decades of media restrictions. Within three years Romanian media proliferated and exercised considerable freedom of expression. There is growing concern that Romania may be limiting the media after changes to the penal code and the 2001 adoption of a new state's secrets law. The 1996 Penal Code makes it a criminal offense to insult public officials and sets penalties for libel as two years in prison, and for slander, five year in prison. Law No. 40 of the penal code governs irresponsible journalism. The government's assertion is that the law was not designed to harass journalists; journalists claim the law can be used to intimidate them. The Committee to Protect Journalists is following the parliamentary changes in the penal code. In 1999, a number of journalists were confronted with libel suits, arrested, or physically harmed. Each journalist was reporting on alleged corruption by government officials. In August 2000, parliament debated a freedom of information bill that established procedures to gain access to information, placed time limits for information disclosure, and included an appeals process. Simultaneously, the Romanian parliament debated a new state secrets law that would limit journalists' ability to access government information or information from government officials. The Ministry of Public Information is under the Department of Communication and Public Image. The ministry's responsibilities are to elaborate on public policy and apply the national strategy and policy in the fields of pubic information, interethnic relations, and relations with Romanians from abroad. It initiates and promotes specific normative documents and assents the national settlements in the mentioned fields of responsibility. The ministry formulates proposals of harmonization for Romanian legislation in public information and minority protection fields compatible with European legislation. The ministry represents state interests before international bodies and organizations on communication issues, initiates and negotiates agreements, conventions, and other international treaties or proposes continuance of existing ones. During 2001, journalists in Romania found themselves involved in an increasing number of libel lawsuits, which allegedly prevented them from writing news stories. The newspaper Evenimentul Zilei was fighting 100 libel lawsuits. Romanian courts do not hold preliminary hearings; therefore the validity of the lawsuit cannot be quickly evaluated. Twenty journalists were given suspended sentences for libel convictions. For some the fine was higher than their annual income. A European Union Report stated that press freedom in Romania was undermined by the extensive use of legal proceedings against journalists, particularly those investigating alleged government corruption. In January 2002, a former presidential aide was indicted after accusing Romania's current prime minister with corruption and distributing the report to embassies and foreign nationals in Romania. Members of the Helsinki Committee on Human Rights expressed concern about the security of freedom of expression and the press in Romania. Article 30 of Romania's 1991 Constitution guarantees freedom of expression is inviolable for thoughts, opinions, beliefs and any creation by words in writing, pictures, by sounds, or means of communication in public. All censorship is prohibited. Freedom of the press involves the free setting up of publications. No publication may be suppressed. The law may impose the obligation of the mass media to identify their sources of income. Freedom of expression is not prejudicial to the dignity, honor, or privacy of the person. Each person has the right to one's own image. Any defamation of the country and the nation, any instigation to a war of aggression, to national, racial, class, or religious hatred, any incitement to discrimination, territorial separatism, or public violence, as well as any obscene conduct contrary to morality, shall be prohibited by law. Civil liability for any information or creation made public falls upon the publisher or producer, the author, the producer of the artistic performance, the owner of the copying facilities, radio or television station, under the terms laid down by law. Law shall establish indictable offenses of the press. Article 31 gives each person the right of access without restriction to any information of public interest. Public authorities are bound to provide for the correct information of the citizens in public affairs and matters of personal interest. The right to information is not to be prejudiced to protect the young or national security. Public and private media are bound to provide correct information to the public. Public radio and television are autonomous. They must guarantee any important social and political group the exercise of the right to be on the air. The organic law of the state shall regulate the organization of these services and the parliamentary control over their activity. Romania is served by three news agencies. The government news agency is Rompres. Private news agencies in Romania are Apres-Romania Libera and Mediafax. All three agencies are based in Bucharest. Romania has three associations of journalists, the Journalists Trade Union (SZR), Professional Journalists Union (UZP), and the Romanian Journalists Association (AZR). The Romanian Ministry of Foreign Affairs issues Press Cards, an important document of identification for all journalists accredited in Romania. It is a basic condition for access to all public institutions including the Office of the President, government agencies, parliament, and invitations to special events. A card is issued once an applicant has provided documents from the agency the journalist is affiliated with and their conditions of employment, photocopies of their passport, visas, photographs, and detailed curriculum vitae. Cards expire at the end of a year but are renewable provided the journalist had published a relevant number of articles, commentaries, and news items about Romania or provided material relevant to productions broadcast on Romanian television or radio. In 1992 the National Audiovisual Council was authorized to grant broadcasting audiovisual licenses to private stations. 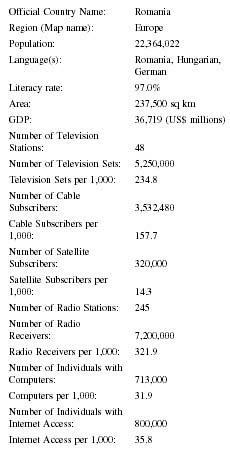 Between 1992 and 1999, 2,046 cables licenses, 217 television licenses, 341 radio broadcasting licenses, 14 satellite television station licenses, and nine satellite radio station broadcast licenses were granted. Radio and television stations broadcast in Romanian, Hungarian, and German. Romania's government television station is Televiziunea Romana. Romania's major private television station is Soti TV. TVR International broadcasts satellite programming. The government-sponsored radio station is Radiodifuziunea Romana. Public radio stations broadcast three radio programs on medium wave and FM. Under the Ceausescu regime all television was under communist control. Ceausescu talked to Romanians two hours each day. Television reception from satellite television was monitored by the communist regime's secret police. Since the 1989 revolution, privately owned television broadcasts rapidly filled the needs of information-starved Romanians. Their Western counterparts absorbed many of these Romanian television stations because they lacked sufficient funding, up-to-date technology, and professional expertise. The American-financed Central European Media Enterprises (CME) is Romania's first national commercial network and offers the nation PRO TV. PRO TV has been criticized for its bias in support of pro-NATO positions and reform-minded political parties. Privately owned and operated Antena 1 and Tele 7abc are attacked for their anti-Semitic reporting and nationalistic positions. International funding of Romania's media runs the risk of shaping pubic opinion in conflict with national interests. Nevertheless, international investment in the media brings the Romanian people into the information world of the European Union nations. Employees of the state-run television network TVR no longer hold secure jobs. State broadcast workers have experienced periods of wages not being paid and extensive layoffs. The lack of government and private Romanian funding for the broadcast media offers the possibility that needed Romanian based programming will be neglected. In 2001 Romania had 50 privately owned television stations and more than 100 privately owned radio stations. State television and radio cover more of the nation, particularly rural areas. Both the Romanian Broadcasting System and the Romanian Television Corporation, now independent and public-service oriented, jointly regulate state run radio and television. TVR1 reaches an estimated audience of 90 percent; TVR2 reaches 60 percent of Romanians; TVR International has five national channels, an international channel, five regional broadcast studios, and its own programming. Major privately owned television stations include: Pro TV, Antena I, Tele 7abc, Dacia Europa Nova, Prima TV, and TV Sigma. Romania's major private radio stations are Radio Contact, Radio ProFM, Radio Total, Radio Delta, and Radio 2M. Brassoi Lapok, Contrast, Romanian Media Company, Valeriu Bargau, and Ziua de Ardeal Newspaper. Radio stations online are: CD Radio Napoca, Radio CLUJ, Radio Cluj, Radio Europa FM, Radio Romania, Radio S.O.S., Radio-Romania, Radio-Romania/Department, Romanian Radio and Television, and Uniplus Radio. Television stations online include: Antena 1, Realitatea TV, Romanian Public Television, Tele 7abc, TV5 Euroope/TV Sigma, and TV Antena 1. Founded in 1994, the Center for Independent Journalism (CIJ) is an independent non-governmental, nonprofit organization offering courses and specialized training for journalists and media organizations. It offers courses, seminars, debates, roundtables, and professional assistance focusing on the media's problems. Specific courses have included: news writing, interview techniques, writing skills, the reporting of political, investigative, economic, and environmental issues, communications, new media, photojournalism, and media legislation. CIJ is an extension of the Independent Journalism Foundation in New York. CIJ provides Romanian journalists the opportunity to meet American journalists with the primary objective of improving the quality of the media in Romania. Foreign trainers include representatives from the New York Times, ABC, CNN, NBC, NPR,the Philadelphia Inquirer, Press Enterprises, Columbia University, the University of Illinois, and Penn State University. The University of Bucharest is regarded as Romania's most prestigious institution of higher learning. The Faculty of Journalism and Mass Communication Studies (FJMCS) program at the University of Bucharest was founded in 1990. Its purpose is to train journalists in order to meet the needs of the contemporary media. The program is distinguished by a hands-on style of training in order to create professional journalists. The FJMCS program is the national model used at other Romanian universities. During the 1999/2000 academic year, 24 full-time professors, 14 visiting professors from other Romanian institutions of higher learning, and more than 30 media professionals, public relations personnel, and advertising groups were on the FJMCS staff. Students can earn a master's degree in either Journalism or Public Communications. There is a doctoral program in Communication Studies. The FJMCS program holds the presidency of the Association of Schools of Journalism in Eastern and Central Europe. Additional Bucharest-based media study programs are offered at Hyperion University, PRO-Media University, University Spiru Haret, and The Superior School of Journalism in Bucharest (Scoala Superioara de Jurnalistica din Bucuresti). The latter university's program has a specialization in the written press. Degrees in Journalism and Public Relations after four years of study are offered at two universities in Timisoara, the Institutul de Studii si Educatie Permanenta Tibiscus and Banat University in Timisoara (Universitatea Banatullui din Timisoara). Romania often has been controlled by outside forces—first the Romans and later the Habsburg and Ottoman Empires. During the twentieth century Romania enjoyed short periods of press freedom, most notably after World War I until the reign of Carol II, and very briefly during World War II from 1943-1945. During the decades of Communist control, basic human rights were brutally suppressed. Under the Ceausescu, regime basic human rights did not exist. After the revolution of 1989, Romania is making progress in bringing Western-style democracy and human rights to its people. These strides were sometimes compromised during the first presidential term of President Ion Iliescu. 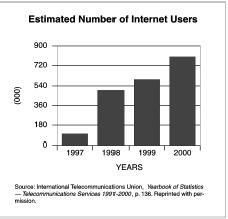 However, since 1996, there have been substantial improvements. Ilescu's overtures of national reconciliation to Romania's former leaders and the Romanian Orthodox Church indicate that the nation is moving in the direction of democracy. It will be difficult to quickly eradicate all authoritarianism in government agencies and from all politicians' habits, but Romania's desire to become a member of NATO and the European Union depend on the nation's commitment to multiparty democracy, a free press, and guarantees of human rights. It is clear that Iliescu wants to leave behind a legacy of democratic leadership, improvement in the well being of the Romanian people, the consolidation of democracy, and to ensure Romania's irreversible attachment to the West. A free press can guarantee that legacy. 1989: The overthrow and execution of Communist President Nicolae Ceausescu. 1991: Adoption of a new constitution. 1992: Temporary return from exile of King Mihai I. 1996: Election of Democratic Front President Emil Constantinescu. 2000: Election of Social Democrat Ion Ilescu as president. 2001: National Reconciliation leads to a government campaign for Romania to join NATO and the European Union. Backman, Ronald D., editor. Romania, A Country Study. Washington, DC: United States Government Printing Office, 1991. Constitution of Romania. Available from www.guv.ro/ engleza/romania/constitutia.htm . Cretzianu, Alexandre. Captive Rumania, A Decade of Soviet Rule. New York: Praeger, 1956. Glenny, Misha. The Balkans, Nationalism, War and the Great Powers, 1804-1999. New York: Viking, 1999. Harrington, Joseph F., Edward Karns, Scott Karns. "American-Romanian Relations, 1989-1994," In East European Quarterly, 06-22-1995, pp 207(29). Hitchins, Keith. Rumania 1866-1947. Oxford: Clarendon Press, 1994. Iliescu, Ion. "Romania's Return to Its Western Identity. Internal Reforms and International Security Contribution." Speech delivered Woodrow Wilson Center, Washington, DC, February 7, 2002.
International Journalists's Network. Available from www.ijnet.org . Kaplan, Robert D. Balkan Ghosts. New York: St. Martin's Press, 1993. Lee, Arthur Gould. Crown Against Sickle. London: Hutchinson & Co., 1953. Lovatt, Catherine. "Surviving on Schlock." In Central European Review, August 6, 1999. Turner, Barry, editor. Statesman's Yearbook 2002. New York: Palgrave Press, 2001. World Mass Media Handbook, 1995. New York: United Nations Department of Public Information, 1995. William A. Paquette , Ph.D.
i found this article very useful for one of my communication projects. the younger generations have to know how it was during the communist regime. How has demography, culture, economy, and political environment influenced the media(or advertising) in Romania? Thanks a lot. It was very helpful and media part was that what I needed. I found more then I expected. Keep your heads up.